Lunch With Bloggers + Thank You! I want to thank each and everyone of you that joined my Share The Decor party. I have to be honest and admit I was so afraid no one would show up! So far 151 of you have submitted your wonderful holiday decor and I truly appreciate your support. The linky will be open until Christmas Eve so feel free to to add additional entries. Blogging has connected me with such wonderful new friends and opportunities I never imagined. Tuesday I had three amazing fellow bloggers to my home for lunch. I wouldn’t have a single picture to share with you if they hadn’t all reminded me to take photos. I love my monogrammed tablecloth even if I don’t have a clue whose initials these are! Being a Southern girl I am a sucker for anything monogrammed. I served crab soup, cheese quiche and a salad sprinkled with feta cheese and pomegranate arials. 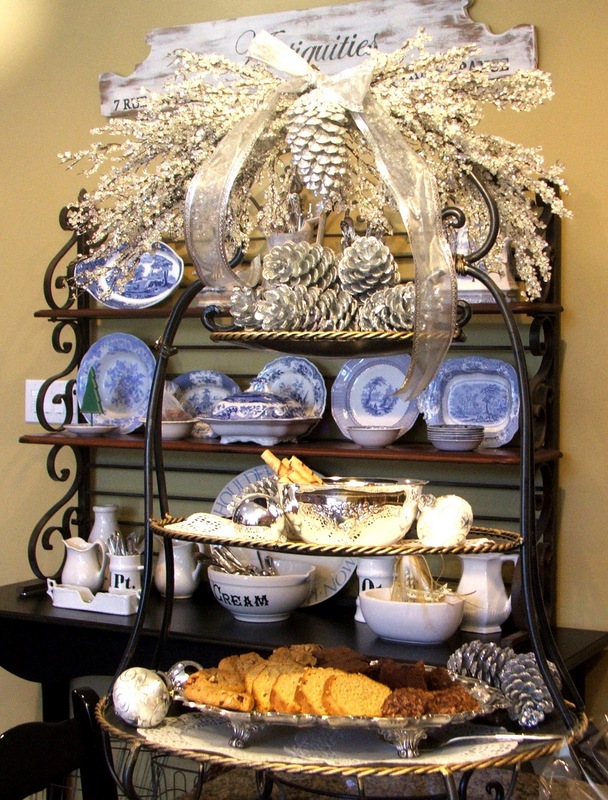 The dessert tray…always my favorite! The paperwhites cooperated and bloomed for the luncheon. I don’t think the ladies knew they were being photographed…. hope I don’t get in trouble for posting this. From right to left is Lynn @ The Vintage Nest, Betsy @ A Perfect Setting and Connie @ Hartwood Roses. Thank you ladies for a fun day and I hope we get together again soon. Sounds and looks as though you had a delightful afternoon. The food sounds great too. As someone who grew up in Alabama, I understand you feelings about monograms completely! Sherry, what fun. I wish I lived close to you. We would have so much fun. Your table was lovely and yay for the paperwhites blooming on time. Your blog brunch table is lovely! 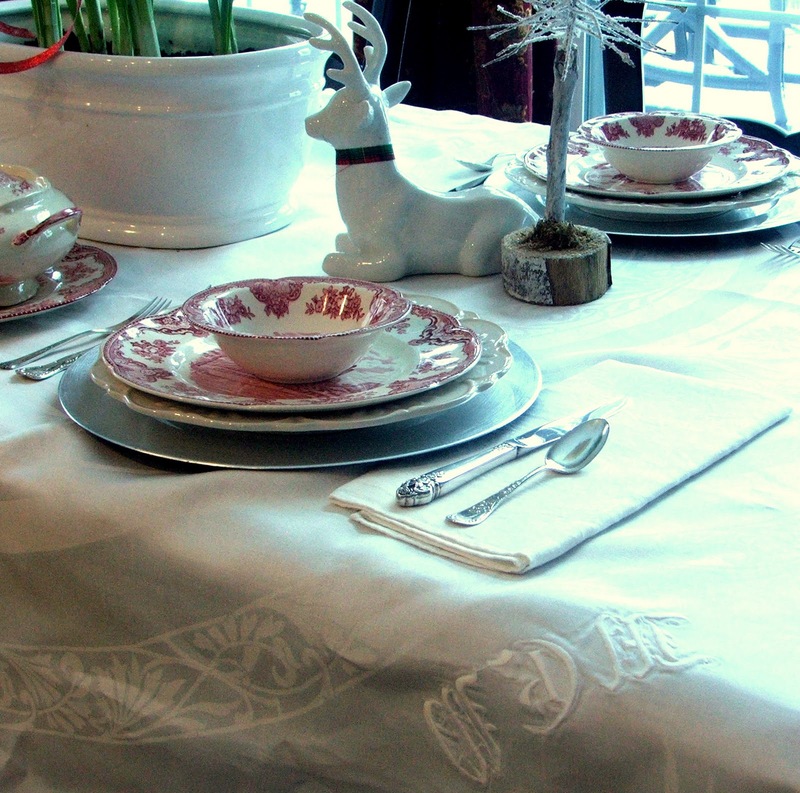 I am a huge fan of red and white transferware. How fun to spend time with blog friends. Oohh…it looks like ya'll had a marvelous time…I would have loved to be there, Sherry! 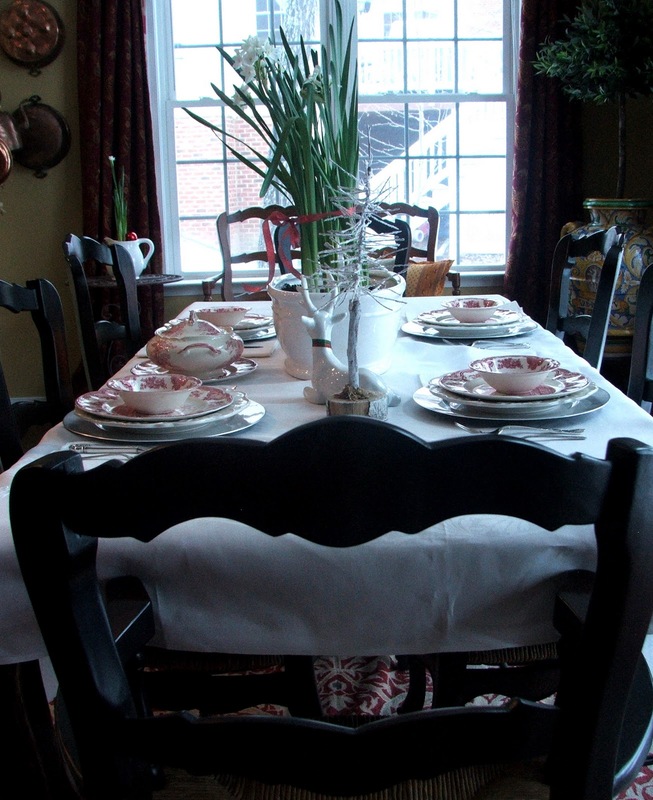 Girlfriend, your table was so pretty…of course, red transferware is my favorite dishes of all time! They look especially lovely at Christmas time…don't you think? 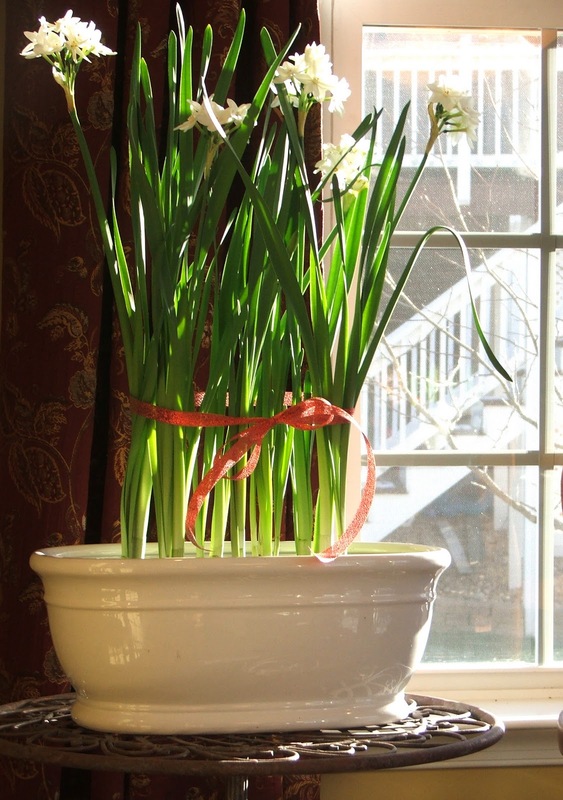 Your paperwhites are simply gorgeous…and they made for a GRAND centerpiece! I have never tried growing them but have seen so many here in Blogland with them…I must give them a go sometime! Loved getting to see photos of the ladies and of your beautiful table…thank you so much for sharing them with us! Again, thank you for hosting the fun Holiday Decor party! It was very successful…maybe you can do this each year? I still haven't had a chance to get around to all of the entries…but I will! I am always so inspired by all the creative and talented people here in Blogland…you, my dear friend…are at the top of that list! Your table looksed lovely, especially the desserts! Looks like you all had a lovely time. 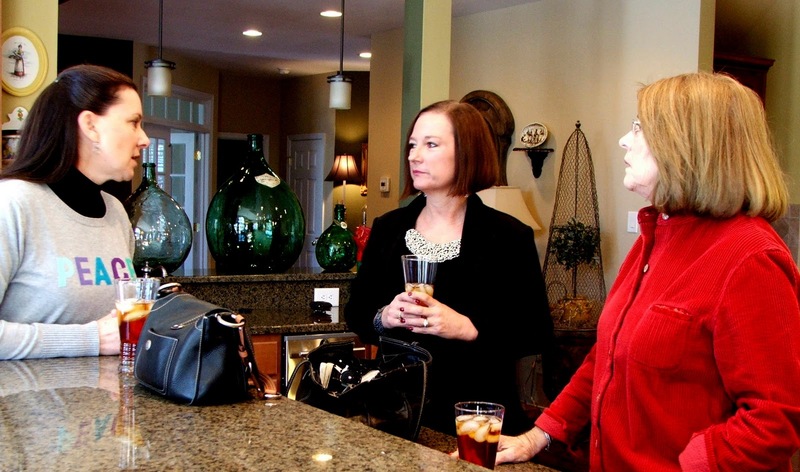 I do know Lynn – she is such a fantastic lady. Looks like you had a great time! I love our Atlanta Blogger get togethers. We have so much fun and I've made some really good friends! Looks like you had a wonderful afternoon and your link party was a great success. I've got to browse around. I wish I would have had time to participate. Maybe next year. Wish I could have been there! I know Lynn was afraid of possible snow. Lynn was green with envy when I told her you might be in Orlando for the big antique extravaganza! 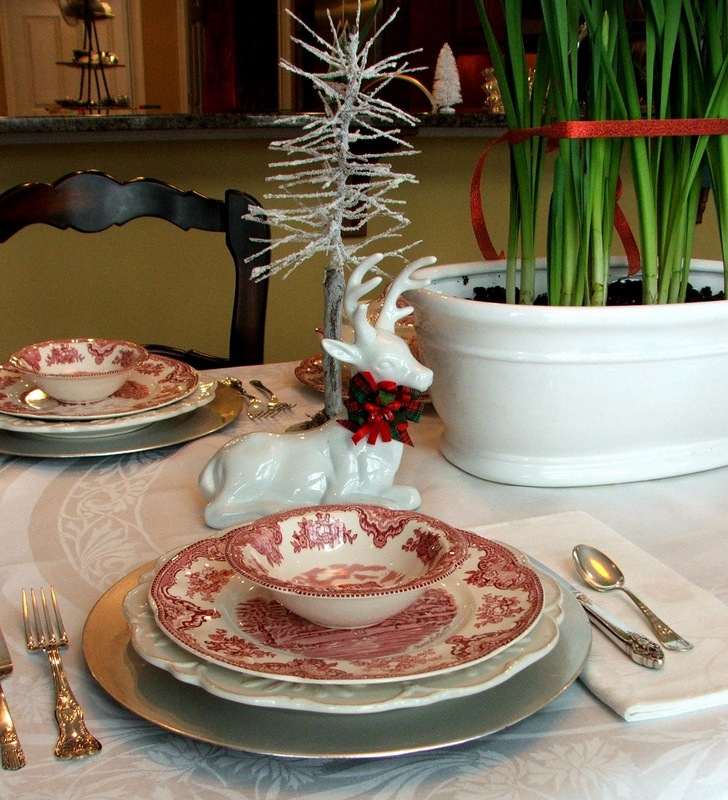 Hi Sherry~ I love your red transferware! It looks so lovely on your table- and the paperwhites are perfect! Looks like so much fun getting together with fellow bloggers for lunch~ Thanks for sharing this at my party! Beautiful table, good food and wonderful friends that's what its all about! Your table setting and Christmas decor are beautiful. I had to laugh at myself when I was reading your post…I can't cook a thing. I might be able to set a pretty table (might) but I'd have to serve pizza and popcorn and pray I wouldn't burn it! I linked over from Inspiration Friday. Beautiful table. I'm going to join your link party. Sherry, What a wonderful afternoon you must have had. You are so right the friends I have met (online only) have been so nice to me. I know it must be a special treat to meet them in person. Entertaining them would be even more fun. I was so glad that I could join your party until Christmas Eve. I hope I won't be that late but I am struggling this year. Lots of things, a tree catastrophe, medication allergies and lack of time management with the blogs and staying caught up with replies and visits. I we figure out a way to handle it, just don't have it down yet. I felt so bad cause I wasn't ready for most of the parties on the 15th. I will just post when I can. Hi Sherry! Oh, I am so jealous of you gals who get to meet other bloggers face to face! That sounds like such a lovely lunch you had and that dessert tray is gorgeous. Thank you so much for linking up to the party! The Dessert tray is beautiful. I like how you have the ribbon on it. I'll look around for a while. What a fun and exciting day for you. I would love to do this, I am not sure anybody lives that close to me – they are all over the country which is very cool, but to be able to chat over lunch like you were able to do -a true connection. I hope you have a very Merry Christmas. Your home looks ready to go -so festive and pretty. Sounds like fun~ your menu sounds delish! Paperwhites are my favorites & so festive! Looks like fun.. Your table and menu are wonderful.. Merry Christmas! Sherry, thanks so much for linking your posts to my party this week. I hope your Christmas is the best! Hi Sherry, I am so glad you remembered to take pictures–they turned out great! Your home is so lovely, especially in person. The luncheon was so nice, and it was fun getting to know all of you and put faces with names. Thanks so much for having us. Your Linky party was so successful! Congrats! I hope to look at all the links soon. Take care, Merry Christmas!! A lovely luncheon. Your table is very pretty! And the food sounds divine! Sherry, I would have sworn that I had already left you a glowing comment on this table but I guess I've had too much egg nog. Your table is beautiful in its simplicity and I'm so glad to find someone else who buys monogrammed linens without worrying who's initials are on them. I love the container your paper whites are in and I'm sure all those who attended your party enjoyed the special attention made to the table. Thanks for sharing and a very Merry Christmas. Wow! So cool!!! I'm not a Southern girl by birth, but I know what you mean about loving any and every thing monogrammed!!! Your paperwhites are so pretty. I can just almost smell them from here! What a wonderful thing to host your fellow bloggers for luncheon! I wish you and yours the very best of the holiday season! I had the opportunity to get together with other lovely bloggers this Fall and what a wonderful experience. Everything was so beautiful and your menu sounded delicious. I know you all had a wonderful time. Merry Christmas. Oh setting the table for other bloggers for lunch must have been so fun! This all looks delightful. Love your pretty transferware and paperwhites! Everything about this is so lovely. Not only is the table just beautiful, but the thought of getting together with other bloggers is even better. I love your dishes, and they look beautiful with the paperwhites as a centerpiece. That's my favorite bulb. I also love anything monogrammed so your tablecloth is just up my alley too. All is just wonderful. I hope you have an equally wonderful Christmas. Oh that sounds like such fun! And it couldn't have happened to a sweeter blogger. You have been so nice to me since I have been in "blogland", and I would like to say thank-you for that. Your menu sounds wonderful! Wishing you and your family a very Merry Christmas and a Happy New Year.